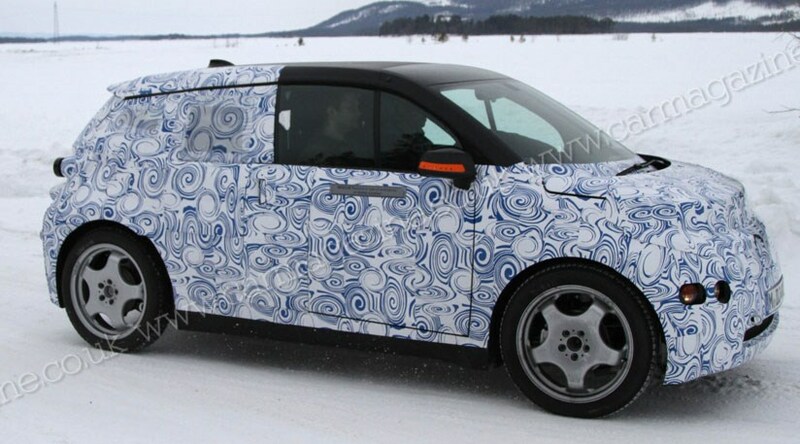 Here's our first glimpse of BMW's new i3 city car, caught during testing in the wintry climes of Scandinavia. BMW i3? Sure it's not a Hyundai with a name like that? BMW i is to alternative powertrain vehicles as BMW M is to performance cars. The i3 is the production name for the Mega City Vehicle project, and will join the i8 hybrid sports car (production version of the BMW Vision Efficient Dynamics concept of 2009) in production at BMW's Leipzig plant when the pair are officially launched in 2013. We've caught them both testing in Sweden in the past 24 hours. Click here to read our scoop on the new BMW i8 and read on for more on the BMW i3 supermini. Although BMW has done a number of city car concepts in the past (readers may be familiar with past concepts such as the E1, E2 and Z13), the i3 will be the first since the days of the BMW-Isetta bubble cars of the '50s to make production. Underpinning the new BMW i3 is a carbonfibre passenger cell mated to an aluminium chassis designed to offset the weight of the i3's LiveDrive electric motors and battery pack. BMW has only offered the vaguest outlines of design for the i3, but from the side view we can see a truncated side window which would fit with the 'streamflow' C-pillar design seen on the teaser sketches of the i3. The i3 is due in 2013, but we would not be surprised to see the new BMW i cars making an appearance - in some form - at the 2011 Frankfurt motor show in September.